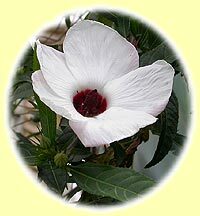 Native hibiscus, especially Hibiscus heterophyllus and some introduced/naturalised species of hibiscus have long been used as a food source in this country. 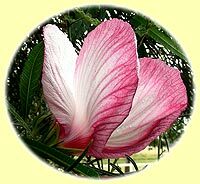 Many web references tell us that native hibiscus (and exotic Hibiscus rosa-sinensis for that matter) are edible, particularly the flowers, while other references mention roots and the leaves (also see Ref #1). 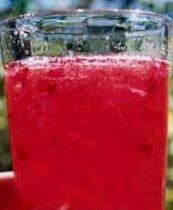 Some Study Group members make and enjoy drinks, syrups and jams made from the blooms of Hibiscus heterophyllus and its crosses. 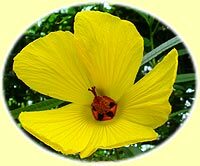 Others have been known to frequently chew up a leaf of Hibiscus acetosella or Hibiscus heterophyllus when in the garden, with no adverse reactions and have even been using them as salad greens for their tangy, acid flavour. 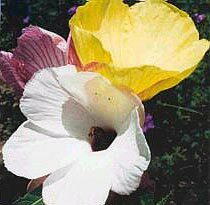 However, our Study Group became aware that there was a perception in the horticultural/landscape industry that Hibiscus heterophyllus is a poisonous plant. This perception is largely based on online references citing one experience where someone consumed the leaves (or tea derived thereof) of Hibiscus heterophyllus which coincided with severe kidney pain. The assumption was that the leaves, whether young or mature, might contain a high concentration of soluble oxalates. 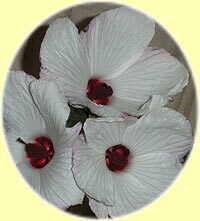 Therefore the Study Group commenced a preliminary investigation into the question of safety in Australian Hibiscus, particularly Hibiscus heterophyllus, both as bush tucker and in modern usage by having the amounts of soluble and insoluble oxalates measured in the leaves and petals. H. heterophyllus selection (White Local) is a small growing shrub originally sourced by Arnold Rieck from Ipswich (to the west of Brisbane CBD). It has been propagated and sold by nurseryman Pete Bevan for a number of years. The white flowers of this selection have been used to make jams and syrups by a number of Study Group members with no adverse effects noted following consumption. H. heterophyllus (Quarry) was sampled from the roadside along Wivenhoe-Somerset Rd near Splityard Creek between Fernvale and Somerset Dam. This white flowering plant was included as a comparator to the other H. heterophyllus specimens. H. heterophyllus Mt. Crosby Cliffs is one of Colleen Keena's selections from the Mt Crosby area west of Brisbane and is grown for its attractive white flowers with pronounced red-pink veins on the backs of the petals. It has also been used to make jams and syrups by a number of study group members with no adverse effects noted following consumption. A H. divaricatus selection which originated from near Marlborough in Central Queensland was included as a species comparator to the next plant, 'Citrus Haze' hybrid. H. divaricatus has gold flowers and narrow leaves. H. heterophyllus x H. divaricatus hybrid 'Citrus Haze' is one of Colleen Keena's hybrids that has yellow flowers all year round and was included because the petals are also considered good for eating and have been used to make good jam and syrups by Study Group members. The results of the oxalate analyses are presented in Table 1. The overall average water-soluble oxalate concentrations for all specimens sampled was 0.49% DW in leaves (range 0.09-1.59%, n=15) and 0.79% DW in the petals (range 0.31-1.53%, n=18). H. heterophyllus (Quarry specimen) had the highest oxalate readings: total oxalate content of up to 2.48% in petals and 1.68% in leaves; water-soluble oxalate content of up to 1.53% in petals and 1.59% in leaves. However, the average oxalate content for this specimen was considerably less (see Table 1). H. divaricatus Marlborough had the lowest average water-soluble oxalate content for both petals (0.48%) and leaves (0.09%). Table 1: Oxalate content of native Hibiscus. Data are means (range in brackets) as a percent (%) of dry weight. Note: 1 gram fresh leaves = approximately 0.24 grams dry weight; 1 gram fresh petals = approximately 0.075 g dry weight. From a human health and domestic animal perspective, the water-soluble oxalate is the significant form (usually just called soluble oxalate). Soluble oxalate concentrations of 2.0-2.5% and above in plant dry matter pose a threat to hungry ruminants (sheep, goats, cattle). Based on the water-soluble oxalate content of Hibiscus heterophyllus found in our study (highest concentration detected was 1.59% dry weight in leaves), it is very unlikely such concentrations would poison these animals. Interpreting these data from a human health perspective is more difficult because information on this subject is scanty, so clear guidelines are difficult to obtain. Poisoning of humans by soluble oxalate is very rare. Most of the few cases known have been associated with eating leaves of rhubarb that have been reported to contain about 7% soluble oxalate (70 g/kg). Stewed rhubarb stems (leaves removed) contain about 0.3-0.6% soluble oxalate. Poisonous doses of soluble oxalate (as oxalic acid) for human adults are reported to be 10-15 g and for children 5-10 g. Children poisoned by rhubarb in one case ate 20-100 g of leaves, the oxalate content of which would be about 1.5-7.0 g soluble oxalate. 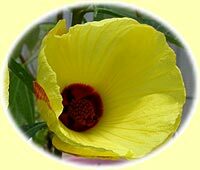 These results suggest that for Hibiscus heterophyllus, you would need to consume about 8.7 kg of fresh petals or 2.62 kg of fresh leaves for a 10 g dose of soluble oxalate. Another way of looking at human susceptibility to soluble oxalate poisoning is to examine the oxalate content of common foods and beverages not known to cause problems. Black tea, the beverage with the most soluble oxalate in one review examined, is reported to contain 375-1450 mg oxalate/100 g = 0.3-1.5% soluble oxalate. This soluble oxalate concentration is comparable to what we found in dried samples of Hibiscus heterophyllus (0.7-1.59% in petals and 0.17-1.53% in leaves). Infusions of black tea contain varying concentrations of soluble oxalate depending on the amount of tea leaves used and the time infused. In one study, 2 g of tea infused in 100 ml of water for 15 minutes produced an oxalate content of 12-17 mg oxalic acid/100 mL. Cooked spinach, the vegetable with the most soluble oxalate, is reported to contain 33.3-168 mg/100 g = 0.0333-0.168% soluble oxalate. On the other hand, fruit of carambola (star fruit) can contain 80-730 mg oxalate/100 g = 0.08-0.73% and have fatally poisoned kidney failure patients but not normal humans. Using these rather limited data, we suggest that native Hibiscus leaves or flowers used as a food or beverage are unlikely to pose a health risk to healthy humans in terms of its oxalate content. However, on the basis of the reports of poisoning by carambola fruit and adopting a cautious approach, we suggest that humans with poor kidney function should not eat this material or drink tea made from it. We thank Brian Burren, Senior Scientist, (DEEDI, Primary Industries and Fisheries) for kindly conducting the oxalate analyses.